Have I mentioned that I love watercolor? This is such a fun card to make. Endless combos possible. Start with a base card of Whisper White Thick, my favorite base layer now! Cut a panel from Shimmery White Card Stock. 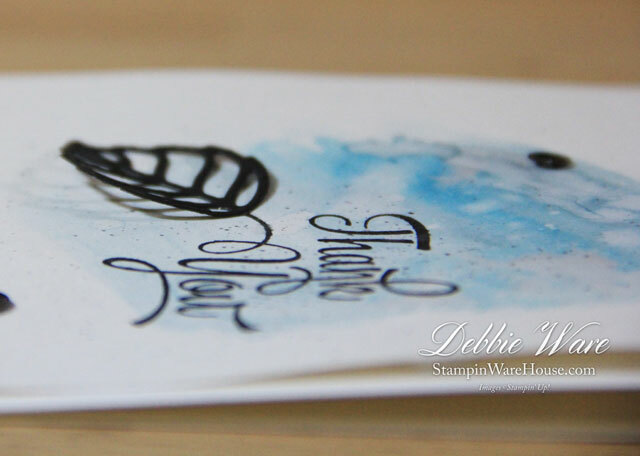 Shimmery White is great for watercolor and offers the shimmer and a little contrast to the stark white of the base. I used my Aquapainter to add the watercolor wash, I think I used Pacific Point and added just a touch of Blushing Bride. Then with my fingers I flicked some water to get the water spots. Then used the Gold Wink of Stella to splatter the card a little with just a little more shimmer. 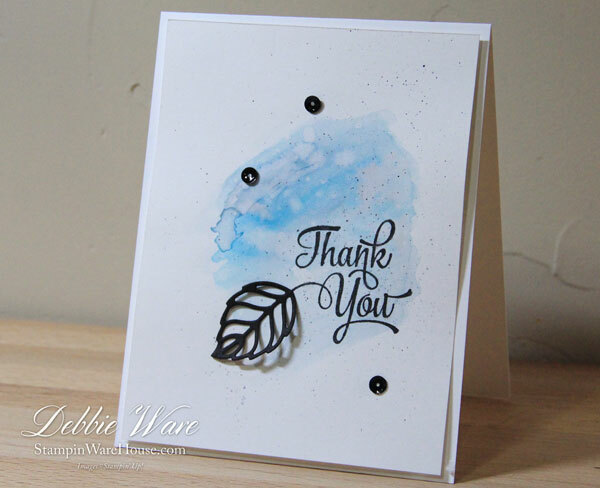 I stamped the thank you greeting from One Big Meaning in Memento Tuxedo Black. The leaf is cut from a scrap of Basic Black using the Flourish Thinlits. I only put glue on the spine of the leaf and I lifted the edges a bit off the card for some dimension. I'll be using this basic layout for many more cards! I think a happy birthday one is in order. Don't forget to check out the retiring products -- some discounted up to 50%! While supplies last so don't wait too long. When placing your order us Host Code 462RNRFM for orders under $150. Happy Easter! Thanks for looking. What color will you use when you make this card?